Equipment: Audio Equipment. Electric Fan. Toaster. Washing Machine. Television. DVD Player. Microwave. Coffee Maker. The building dates back to the 1800s and is located in Plaza Dorrego one of the most visited areas of Buenos Aires. Even though there is always something happening, noise from the street is not a problem because the apartment is set deeply in the building. Designed and decorated professionally, it has many features that you would not expect to find in most apartments. Separated dinning room under a glass roof. 2 bedrooms. The master one, with a double bed. The second one, with a sofa bed. One word: Perfect! It's a very charming, old building with lots of architectural details. The apartment is as it as seen in the photos, high quality spaces and comfortable. 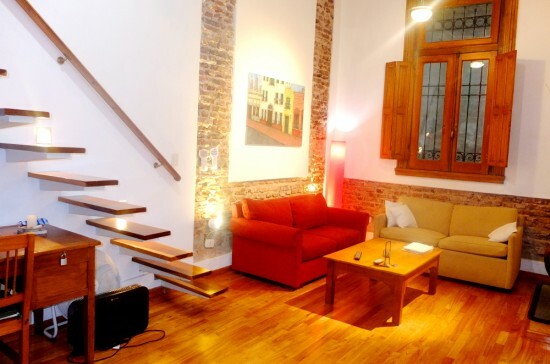 I went to San Telmo to live and work; rented this unit for a month. It was very clean and the weekly cleaning/linen service was most appreciated. Since I was working, the office desk/work area met all my needs; Wi-Fi connection is dependable and had an excellent speed. I was looking for a good location and this is it – you are right on the plaza, but the apartment is set back in the building so you hear no noise at any time. There are buses and Starbucks one block away, groceries are available on Bolivar and Peru. I could stay for another month and not begin to duplicate the restaurants that are available within walking distance. I had a bonus amenity – there is a composer/actor living next door and I was serenaded for a short time most evenings with a piano concert. No, he wasn’t practicing – he was playing great music. The music was faint, but I appreciated the performances. I had a great experience in this apartment, and really enjoyed the area of San Telmo, definitely the one if you are looking to see and feel the real Buenos Aires, and it’s central to everything. If I should ever return, this is where I would stay. This my second time staying at this apartment and I have to say I love everything about it. It is in a vibrant and noisy part of San Telmo and yet the building and the apartment itself feel like an island of tranquility. From the moment you enter the building you can feel the atmosphere of calm. The apartment itself is beautifully decorated and extremely comfortable. It had all of the amenities I could hope for. I loved the fact that there were two bathrooms. Although I rented the apartment on my own, I had a friend stay in the second bedroom frequently. She found the pull-out bed to be very comfortable. Staff is professional and responds quickly to issues. I found all of the staff members that I dealt with to be engaging and helpful. San Telmo is absolutely my neighbourhood of choice. Location is excellent. If you want to explore the city and have the comfort of staying at a house, this is a good place to stay! It was a little cold on the first night, and staff took care of it immediately. Can be a little noisy at the weekend, since the fun is going on till late at night. If you want to join the fun, have a few drinks, and watch people dancing Tango, you are just meters away (not literally, really!) wi-fi was working great. Enjoyed the stay at this lovely apartment, with a nice decoration. Apartment is nice and quite interesting. The stairs pictures in the photos are something that I have never seen before! It adds flair and modernity to a charming historic place. I stayed alone and the upstairs bedroom was quite suitable. The downstairs bedroom is quite small but can host someone in a pinch. The layout of the apartment includes outdoor components which was unexpected in the middle of an apartment building but very welcome. The location is at Plaza Dorrego which is the main plaza of San Telmo. The apartment is set further back in the building so that you do not hear or feel the outside. But as soon as you step out, you are in the middle of the action. It's the best of both worlds.The owner was very accommodating. When I first arrived, I asked for a few items and she was quick to respond. I would recommend this apartment. Yvonne and I loved our stay at the Elegant Apartment in San Telmo. The apartment was great as was the location. There were lots of great restaurants and coffee shops nearby and the markets were wonderful, especially on Sundays. Transport was excellent - we loved the subway. The owner took very good care of us - it was a bit like a family. She even arranged a taxi to pick us up at the airport. Magic! We would certainly stay there again. As others have indicated, this apartment was exactly as featured in photos and is well situated in San Telmo, as previous reviewers have indicated. Three sets of friends visited us for meals, and each was impressed with the look and size of the space (they ranged from 20s to 70s in age, and two of the three sets live in Buenos Aires, so have good basis for comparison). It's important to note that we were promptly met when we arrived, received quick responses to any problem (the coffee maker was broken, for example, and replaced within an hour), and were even the happy recipients of good advice from the owner on everything from milongas to hair stylists. The air conditioning, while effective downstairs, required a fan to cool down the upstairs loft bedroom, and one did have to exercise care in getting out of bed not to fall down to the first floor! But as a mid-60s couple, we'd recommend this to people of any age who can climb a staircase, don't mind a bohemian neighbourhood (read: somewhat dirty streets with a wide range of characters), and like the charm of an older building. We loved staying here, such a great place to spent some time hidden away in the streets of San Telmo which is a lovely old, authentic part of Buenos Aires to explore. Make sure you check out the huge antiques market on a Sunday and take a tango lesson in one of the numerous ballrooms and dance halls in the area. As a tangodancer I just loved this place. Perfect for private lessons at home, quiet in the morning when I wanted to sleep, a very kind and reliable maid, spacious enough for guests and a perfect location. Good atmosphere. I was pleased with this appartment. I was an exchange student in BsAs and me and my friends decided to rent this lovely house that became our home for 7 months. I strongly recommend this house, it is in a lovely spot, very close to the centre and you can walk pretty much anywhere!! we definitively loved it! My name is Ebred Reijnen, professional violonist. Since I had a concerttour through South America wich ended in Buenos Aires, I decided to stay in BsAs for another 2 weeks. On internet I found ''Casasantelmo'' on the internet and rented the appartment on ''Humberto Primo''. I can tell everyone that this is a very fine appartment, with a great atmosphere and exactly on the right spot: Plaza Dorrego is the place to be ! The hospitallity and support of the owner was great and I can recomment everybody to go there and get yourself a very professional and relyable advise. My wife, granddaughter and I spent the whole month. We found it to have everything we need for a very comfortable stay. A friendly, pleasant maid came every week and did an exclent job. The apartment is far from the street so there is no noise. One very good feature for us was the location. Close to food stores, deli, bakery, fish market and the city market. I would be very happy to stay there again. If you are in the area I would recommend Don Ernesto Restaurante. Ask for Gus or Chris. Thank you for all of your assistance while we were staying at Humberto Primo. Rosie and I loved the apartment and San Telmo. I could spend months in Buenos Aires checking out all of the neighborhoods. Also, thanks for inviting us to the Christmas Eve party. We really enjoyed ourselves and it was a very nice thing for you to do. I am sending you a photo my husband took of our home in the snow storm. I am so glad I was in Buenos Aires instead!